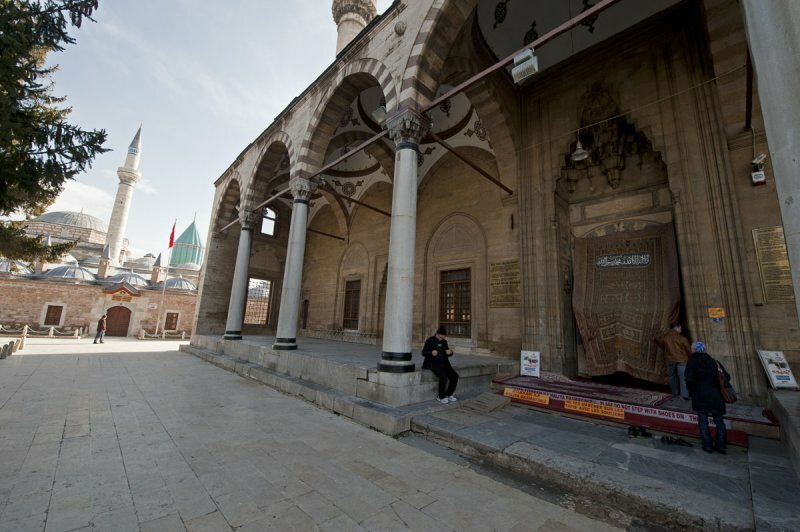 On the picture: The northern facade and porch of the Selimiye Camii (located next to the Mevlana Museum). The mosque was commissioned in 1558 by the future Selim II (he was governor of Konya at the time) and finished in 1570, after he ascended the throne. The plans are attributed to Mimar Sinan. The mosque was repaired in 1685, 1816 and 1914. The heavy curtain that closes off the main entrance consists on its outer side of an antique kilim. Source: Website of ‘mimarieserler.blogcu.com’ .